3 Who should buy the Wilson Blade 98? One of my first tennis racquets as I started the move from intermediate to advanced player and still one of my favorites today, the [amazon_textlink asin=’B00AACXR3A’ text=’Wilson Blade 98′ template=’ProductLink’ store=’racquetspor06-20′ marketplace=’US’ link_id=’6dece4b3-3983-11e7-bbb2-598302fd091e’] is meant for those aggressive and high energy players on the court. Just to give you some background, I started playing with the Wilson Blade 98 as a teenager around age 16. I used this racket all throughout Varsity Tennis in high school and through my first 2 years playing college tennis. At the time, I absolutely loved hitting big shots right at the limit of my power. And for this, the Wilson Blade 98 proved to be the perfect racquet. I’m going to take you through every aspect of this racquet to determine if it will do for you what it did for me and my game. While this is a slightly older version of the Wilson Blade 98, this review takes into account my experience with older versions and other’s experiences playing with the most recent Blade. Holding this racket as you walk onto the court, you can feel the slight heft of the racket in your hand. It’s by no means heavy though coming it at a weight of 11.3 ounces. Actually, I as started warming up to play a game, I started warming up to the weight of the racquet also. It’s heavy enough to remind you that you’re swinging a racket yet light enough to play with for long hours. The weight of the Wilson Blade also has another advantage in that it allows you to put some power behind your shots. Wilson specifically targeted this racket towards aggressive players who like to hit big shots and the weight of this racket certainly allows for it. 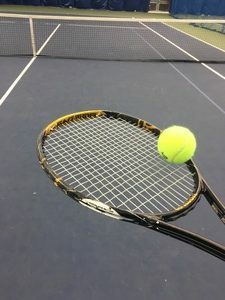 As I started getting into a rhythm with my strokes and rallies with my partner, I specifically took breaks just to write down how this racket felt. One of the things that I especially liked was the pop off of the string bed of the racket. I would make contact with the ball and instantly feel a slight response as I swung through it. Looking over the frame construction, this pop and most of the power in this racket is due to the layup of graphite-basalt within the frame. One of the first tennis racquets in my collection, the Wilson Blade 98 still has a special place in my heart. I also liked how Wilson improved the response to off center hits in this version of the Blade 98. 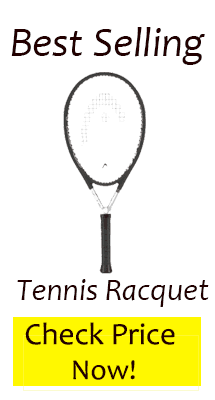 In earlier versions, your racket would almost twist out of your hands if you hit it off center. In the latest version(2016), the Wilson Blade 98 is much more forgiving to hits outside of the sweetspot. Going from my previous racquet to the Blade 98, made my serve one of my biggest advantages in my competitive games. The Blade 98 took my first serves and amplified all of the power behind them while still providing me with enough control in order to make sure they stayed in. For people who like to hit flat and powerful serves, the Blade 98 will serve you well. One area where the most recent Wilson Blade 98 falls a little short on the court, is with regards to spin. And, being completely honest, this is mainly a function of the string pattern and not the racket itself. The most recent Wilson Blade 98 is strung with a 18×20 pattern or a traditional “closed pattern”. While this does give you terrific control over where you hit the ball, it makes it slightly harder for players to apply lots of spin to the ball. 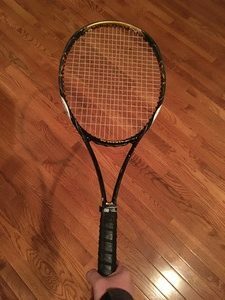 The good news here is that you can easily grab a slightly older version of the racket(which is strung in a 16 x 19 pattern) which will give you that spin capability back. 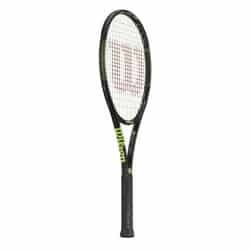 Wilson constructed the frame of the Wilson Blade 98 out of braided graphite and basalt which are both lightweight yet strong materials. By using a combination of two materials, the Blade 98 can flex slightly more which increases the contact area between the ball and the strings. To the players out there, this means you can feel more of the ball and have greater control. The latest version also features parallel drilling which claims to provide a more consistent response from the string bed while also increasing the sweet spot. It does this by drilling the grommet holes such that they are parallel to each other(hence the name parallel drilling). This method results in additional string movement which increases the size of the sweet spot. The Wilson Blade 98 features a string pattern of 18×20 also referred to as a traditional closed pattern. While this pattern does provide control, it is not as good at putting spin on the tennis ball. Usually the less cross strings you have, the more spin you can easily apply to the ball. Usually racquets such as the Wilson Juice 100S or other racquets using a 16 x19 string pattern make applying spin easy. The Wilson Blade 98 also incorporates Wilson’s Amplifeel technology which reduces vibrations throughout the frame in order to enhance player feel and comfort. This vibration dampening technology specifically helps people who suffer from joint pain and tennis elbow. The Sony Smart tennis sensor aims to use technology to help you improve your tennis game. Another interesting fact about this racquet is that it is compatible with the Sony Smart Tennis Sensor. 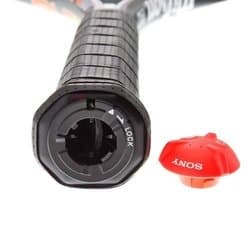 If you have never heard of this, the Sony Smart Tennis Sensor is a sensor that sticks to the bottom of your tennis racquet grip. Using the data acquired by the sensor, you can analyze your shots and more in it’s companion app. Some people have complained about the sensor falling off the handle though so be sure to do your research before purchasing one. As I do not have personal experience using it, you can check out more reviews of it on Amazon. Who should buy the Wilson Blade 98? Wilson designed this tennis racquet for the aggressive player who likes to put a lot(maybe too much) power into his or her shots. The Wilson Blade 98 provides the perfect mix of power and control for this player in order to help them quickly take their game to the next level. See Additional Reviews, Pictures, and More Information about the Wilson Blade 98 Here! In terms of level, most players from intermediate to advanced would get an immediate benefit in their game from using the Wilson Blade 98. Again, it’s one of my favorite racquets and it excels at it’s purpose. If you are looking for a little bit more control in order to reign in your power, the Wilson Blade 98 tennis racket is for you.